Dodd at 502m (1,647ft) is a small fell in comparison to the rest of the fells in the Lake District. It lies on Forestry Commission Land known as Dodd Wood about 2½ miles north-west of Keswick. 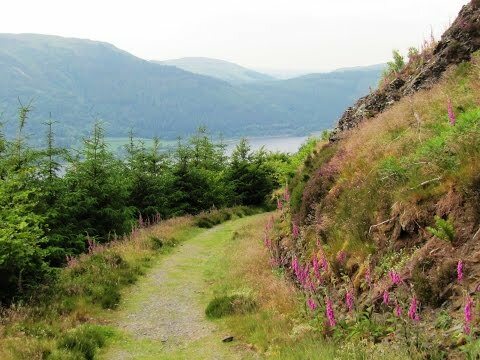 Before 2001 Dodd was extensively planted with conifers right up to its summit which obstructed the wonderful views over Derwent Water and Bassenthwaite Lake so the Forestry Commission began a programme of tree clearance from the top of the fell. They then hoped the clear summit would revert to heather moorland. The summit is marked by a stone memorial pillar and from here the whole of Bassenthwaite Lake, Derwent Water and the fells beyond can be admired. Dodd which forms part of the Skiddaw range is usually climbed from Dodd Wood car park by following the waymarked route to its summit and the walk may be continued to Carl Side and onto Skiddaw. In the 1860’s Dodd was home to a Scottish hermit called George Smith who became known as the Skiddaw Hermit. He lived on a ledge in a wigwam type tent, in all weathers, because of his love for the outdoors. Dodd Wood has become very popular with visitors and birdwatchers due to the only pair of nesting Ospreys in northern England. The wood offers some wonderful waymarked trails and is home to the Red Squirrel. There is also the Old Sawmill tea room which was originally a working sawmill until 1970 and was converted to a tea room in 1981. There are two Osprey viewpoints, the Lower and the Upper and they both provide high powered telescopes and binoculars. The lower one is open from April to September between 10am and 5pm daily and the upper one is open from 10.30am until 4.30. The Ospreys can be seen fishing, sitting, feeding, washing and flying over Bassenthwaite Lake. There are staff and volunteers at the viewpoints to answer any questions you may have and there is a tablet showing live footage of the Ospreys and their chicks. The Ospreys returned to the Lake District in 2001 after more than a hundred years and have nested here since. Bassenthwaite Lake about 4 miles long and three quarters of a mile wide is one of the largest but very shallow water bodies in the Lake District and is the only body of water in the Lake District to be defined as a lake and named as a lake all the others being waters, mere’s or tarns. The lake lies in a glacial valley and is fed by and drains into the River Derwent. The lake contains salmon, trout, pike, minnow, perch, dace, ruffe, and eel but mainly roach. Keswick is a market town now mainly tourist orientated due to the many thousands of tourists visiting every year and the majority of side streets are abundant with B&B’s. Derwent Water is about 3 miles long by 1 mile wide and sits on the south edge of Keswick town and is fed and drained by the River Derwent. The river also connects Derwent Water to Bassenthwaite Lake. From the car park we turn right between the public toilets and the Old Sawmill tea room. We then cross over the bridge and turn left following the green arrows of the Dodd Summit Trail. After reaching the summit of Dodd we continue to follow the green arrows only turning off left at the Osprey Viewpoint sign to visit the view point. We then about turn and make our way back to the car park. The map below is an approximate route and guide. There is a free leaflet about the walks in the wood displayed outside the public toilets. This is a moderate to hard walk on good paths and tracks through woodland with some steep inclines and declines. Elevation: approx lowest point 123.4m (405ft) approx highest point 490.60m (1,609.6ft) total ascent 446.50m (1,465ft). Approx 4 miles allow 3 hours using OS Explorer Map OL4, the English Lakes North-western area. Start point: Dodd car park at the side of Bassenthwaite Lake on the A591. Dodd Wood is north-west of Keswick in the north-western fells of the Lake District, Cumbria. Travelling from the east on the A66 after passing the A591 Keswick turn off on the left continue along the dual carriage way then at the next roundabout turn right onto the A591 again towards Bassenthwaite. Continue for approx 3.5 miles and Dodd Wood car park is on the right. Parking: Dodd pay and display car park. Fees are depending on length of stay. There are public toilets and the Old Sawmill tea room at Dodd Wood car park. The next nearest facilities are at Keswick.